Regular readers will know that have a huge weakness for Korean food, so I thought it was time to start making it at home. Gochujang is the delicious fermented soy and chilli paste that appears in many Korean stews and BBQ dishes. This is my take on a traditional Korean stew, sweet and spicy it's not for the feint hearted but I personally will be making this a regular rotation in home cooked meals from now on. Prepare your vegetables; Dice the onion, julienne the carrot and capsicum, crush the garlic and cut the potato into cubes. Heat a pan with a small pool of your favourite vegetable oil. Stir fry the onions, then the capsicum. When the peppers are soft add the carrot and the garlic and stir fry until the garlic is soft. Add the gochujang and stir fry to coat the vegetables. Add the water and stir so that the chilli paste forms a sauce. Add the tomato paste and the sugar, stir until well integrated into the sauce. Taste at this point to balance the flavour, add more sugar or chilli to taste. Add the potato and cover the stew, boil until the potato is soft. Dice the tofu and add to the stew, cook for a further two minutes and then take off the heat. Let the stew rest for 2 minutes and serve with rice and your favourite pickles. Serves 4. Great for vegans and vegetarians but for a meaty twist add diced fish cake in with the potatoes. They recently renovated Star City Casino and turned it into The Star Casino Complex and my gosh but it's a lot nicer. 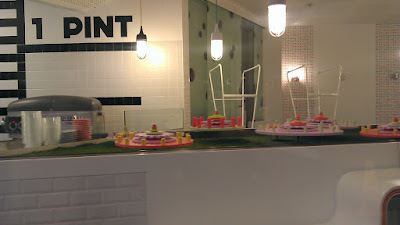 So accordingly I'm slowly eating my way through the new eateries since it is conveniently right next to my office. It was recently the boy's birthday so we stopped for a spot of Japanese at Sokyo in The Darling, the new Hotel attached to the Casino. 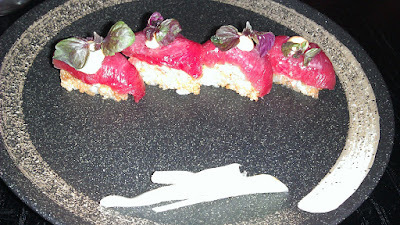 The food is traditional Japanese and modern Asian Fusion with a twist. The usual high quality Japanese dishes you would expect in Sydney appear on the menu. I would definitely recommend perusing the tempura specials, do not pass up the tsukune and this Spicy Tuna on Crispy Rice was worth the trip alone. Sokyo needs some time to find its own identity. At the moment they've made it a little too slick and it just feels a little fake. It's like trying to make your video 'go viral', this is not a notion you can instill, it needs to be given to you by the public. The waiters are all eye candy cute young boys with stylish shoes, which is great and all but not so much for service. I hope they rectify this, the waiter we had was French and didn't seem very comfortable with Japanese food, nor could he recognise that we were and wanted to be left alone with the menu. All in all this place needs to find its feet but will nonetheless become a regular visit for me. The price and range mean that you can eat your way through a whole kaiseki or just have some sushi for a short business lunch. This is the perfect local eatery for client meetings in a flash setting, but needs time before I'll return on a date night. 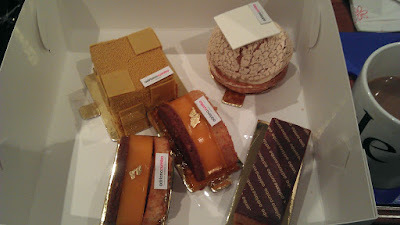 I work in Pyrmont close to The Star casino complex and an exciting new addition has come to the neighbourhood; Zumbo Patissier the super luxurious, delightfully decadant cake and pastry maker that makes all foodies in Sydney go to happy little day dream places. 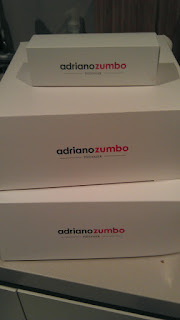 The love child of culinary genius Adriano Zumbo this store makes an excellent addition to The Star's recent upgrade. Sadly being January things are a little more sensible on my diet this month but it's definitely worth noting the Dessert Train! Set up like a kaiten zushi with small pieces of delight wizzing past on a motorised conveyor belt. Note if you are intending to go that there's a significant wait on popular nights, so don't expect to pop straight in after a meal or a game elsewhere in the building. 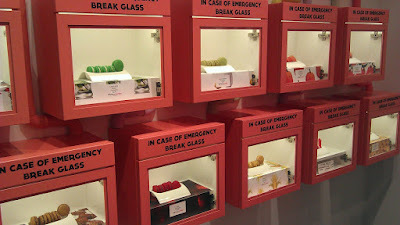 Sydney is still on a long running obsession with macarons (cupcakes are sooo 2008) and Zumbo's is definitely one of the best purveyors of these delights. Remember though these little pieces of heaven are delicate and difficult to make, meaning they're definitely a 'treat' food and should be purchased the day you intend to eat them - humidity is the bane of all macarons. 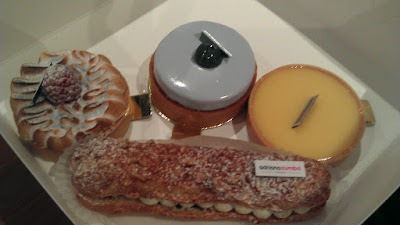 It was recently my birthday and since I have the luck to date a lovely man who shares my taste for all things rich we went on a trip to the patisserie for some serious birthday cake. Shown here is Salted Butter Caramel, Pumpkin, Lemon Verbenna and Coconut Green Chilli & Lavender. All light, perfect and delicious. I think I could eat a meal of those salted caramel delights and be happy. ssnowmanorr $9 Pâté a choux, bubble tea custard, lychee coconut crème légère, lychee gel, coconut crunch. 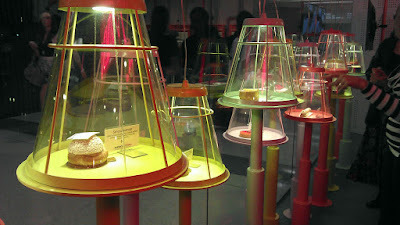 Zumbo loves delightful little food tricks and this is genius, it is essentially a bubble tea made into a delightful little cake, complete with milk tea flavoured custard and chunks of Lychee jelly. 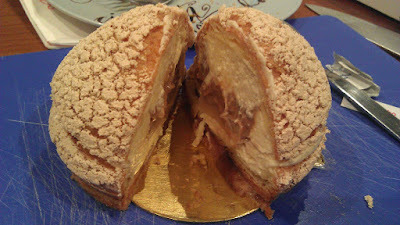 Despite the heavy creamy interior the outside maintained a light crisp texture that oozed when bit into. This was probably my favourite of the lot, I would love to see the mould that the lavender and creme layer was made with to get it out so smooth and perfect. 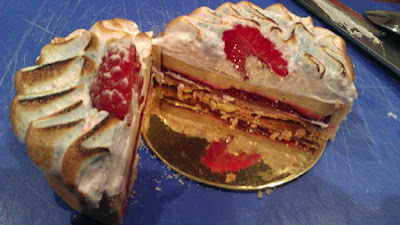 The bottom was a slightly tart mix of almondine and berry that was offset perfectly by the sweet sweet cream layer. 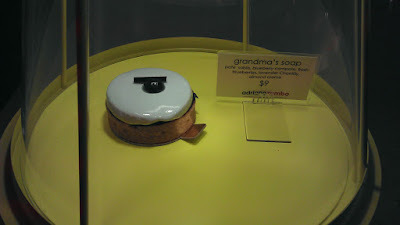 This was definitely the boy's favourite. WhizzFizz is a brand of Australian sherbert, the sugary fizzy kind not the cold kind, so expect something a little different from this raspberry meringue pie. 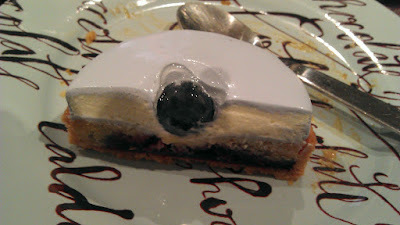 The crisp light meringue gives way to rich berry and cream; don't be afraid of the liquorice if you are not a fan it's not strong and compliments the fruit layer perfectly. The texture and construction of this dessert is simply amazing. 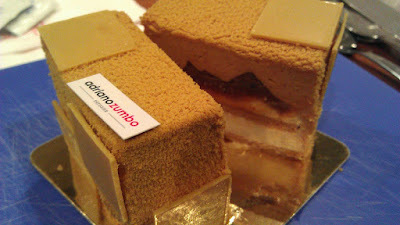 It's a tiny entremet cake with many finely created layers in a small caramel 'box' with a texture like felted caramel. with the amount of caramel in here you'd think it would be sweet on sweet but there are darker burnt sugar tones and the ginger that set the mouth ablaze. An absolute amazement in construction and to make this many flavours work together in harmony deserves accolades. Be aware this was simply ridiculous amounts of cake and took us several days to eat, even without me dissecting and photographing every morsel we bought. 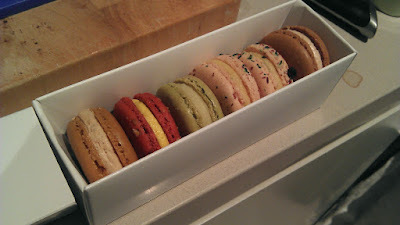 One and a half of these tiny rich delights was more than enough to fill me up despite no dinner. If you're looking for a fancy gift for an in law or just a small delight for a special occasion one or two of these with a cup of unsweetened coffee would delight even the grumpiest of diners. Much recommended, with quite a bit of willpower wrangling to stop me running over on a regular basis.